In September and October you can harvest what we in Norway call our “forest gold”: Bright yellow chanterelles. Bring a mushroom basket and explore the nature. Chanterelles often grow in mixed forests with birch trees, and there are good chances to find these tasty mushrooms by old trails and roads. Do you have roast beef or venison roast remnants from last night’s dinner? Make yourself a delicious sandwich for supper. 1. Fry the chanterelles in a hot pan with butter, and season with salt and pepper. 2. 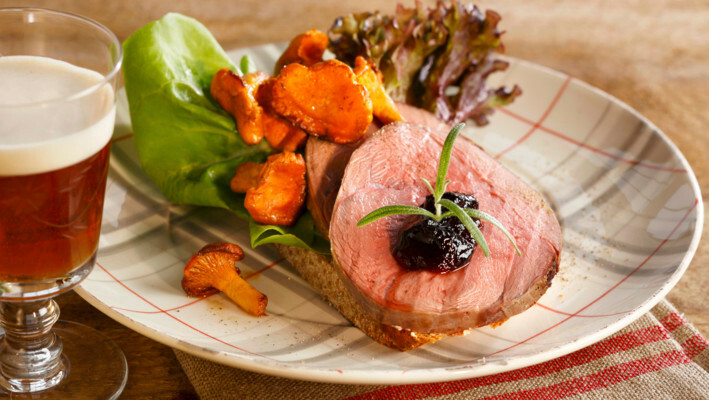 Fill the bread with lettuce, slices of roast beef or venison roast, chanterelles and redcurrant jelly. Garnish with fine herbs.